SAL DeTRAGLIA'S VIRTUAL TAPAS BAR: INTERNET IS AN EXPAT’S BEST FRIEND. INTERNET IS AN EXPAT’S BEST FRIEND. My great-grandparents were Italian expats. They moved to the US nearly one hundred years before the Internet. Expats without Internet! Can you imagine?! I don’t know how the hell they did it. - REACH OUT AND TOUCH SOMEONE. The biggest misery for any expat is, most likely, missing his friends and family back home. That’s assuming, of course, that those same friends and family weren’t the reason that he fled the country in the first place. So how is one to keep in touch with his loved ones? Email, Instant Messaging and voice-over-IP calls (using services like Skype) are good options. But I recently discovered something even better. Something woooonderful! I discovered...video chat! 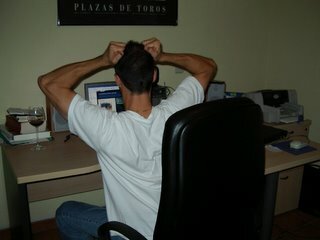 Using software from services like Sightspeed (in my case), MSN Messenger or iChat, you can see and talk to friends and family—realtime!—through your computer screen. And it’s free! All you need is a high-speed Internet connection and a webcam. And a computer, of course. I’ve been video chatting with the US for months, and quite honestly...it’s almost like I never left home. I can join in a round of “Happy Birthday” during my nephews’ parties. I can trade barbeque tips with my brother. I can get lectured by my grandmother for being too thin. And it’s all “virtually” face-to-face. The burgeoning video chat world is, in my opinion, the greatest boon to expats since quinine pills. - PLEASE! NO MORE BISBAL! Try as I might (and admittedly, I haven’t tried very hard), I’ve failed to acquire a taste for the syrupy Latino pop music that blankets the Iberian radio airwaves. For the longest time, I’ve wanted nothing more than to sit at my work desk and groove to some of my favorite radio stations from back home—or at the very least, a station uncorrupted by the likes of Bisbal, Chenoa or Bustamante. Then I began poking around the Internet and discovered the glorious world of Internet streaming radio! These are radio stations from around the world that broadcast directly through the Internet and out your computer speakers. There are thousands of them! Using a search engine like www.radio-locator.com/ or the “Radio” tab on your iTunes software, you can listen to blues from Chicago...or news from NPR and the BBC...or bossa nova from Paris. There’s even a station broadcasting from Antarctica—although I don’t imagine there are many Antarctican expats living in Spain. - I’D KILL FOR A BUTTERMILK PANCAKE. I love the food in Spain. But I often find myself pining for foods back home. Carolina pulled pork! Or buffalo wings! Or a good ol’ American buttermilk pancake. Pining often turned into whining. But there’s no reason to whine. Why? Because if you’ve eaten it, then you can find the recipe on the Internet. Websites like www.epicurious.com have thousands of recipes just begging to be downloaded, printed and whipped-up on the Teka vitroceramica stovetop that you bought from El Corte Inglés. But...but...how can I make buttermilk pancakes if I can find buttermilk in Spain? Once again...the Internet comes to the rescue. Websites like http://chef2chef.net/kb/index/86-substitutions-other.htm will tell you how to make a reasonable facsimile of many ingredients that might be hard to find in your adopted country. Sorry, but they offer no suggestions for simulating vegemite. - WHAT? ANOTHER BIRTHDAY?! During my first year in Spain, I spent more money shipping birthday, wedding and Christmas gifts to the US than I did buying the gifts in the first place. Then I wised-up, and started shopping “locally” via on-line stores like Amazon. [fill in the blank], www.llbean.com and countless others. This has saved me a lot of time and money—although I doubt that it will be much help to that guy from Antarctica. - ALL I WANT IS A SOFT SHOULDER TO CRY ON. There are times when a distraught expat needs to comiserate with another who has walked in his moccassins. When this need arises, I find the expat blogger community to be an invaluable support network. Expat bloggers are tightly-knit group—but an open one. Joining is easy. All you need to do is find one good expat blog, and then check it’s sidebar. It’s likely to list links to dozens of other expat blogs. Then it’s just a matter of making the rounds each day and adding reasonably tasteful, intelligent comments to the various posts. You’ll quickly build a rapport with an expanding circle of virtual expat friends. And these folk—ranging from Canadians in Germany to Kiwis in Belgium to Italian/Turkish/Greeks in Canada—can be great sources of insight, advice and compassion. If there’s a downside to the Internet, however, it’s that overreliance is likely to retard an expat’s learning and mastery of the local language. I’m a prime example of that. But each expat must look within his heart and ask himself what’s more important? Knowing the correct use of the Spanish present subjunctive? Or knowing that one cup of warm milk mixed with one tablespoon of lemon juice will result in a passable substitute for buttermilk? I'm not an expat, therefore I have nothing much to say other than I wanted to be the first person to leave a comment! Rumour has it that you can get Eastenders, the English soap, and UK football, too. Neither of which I like... but some folk are dreadfully keen. Music downloads, Amazon books and recipes are the big ones for me. (by the way thanks for the Cayena comment: yes had discovered those, but had not tried the olive oil thing... yum. Someone else has bought me some bonnets out now, so it's jerk chicken on Sunday, yay! I was brought up as an expat in Bangladesh. We had to fly to Calcutta (or Kolkata nowadays)to buy toilet paper, Bangkok for toothpaste and booze came in huge consignments every 3 months. Hey you, I loved this post and it's so true. I just spent the day with an expat friend and she helped me put my world back in order. And how did I meet her ... the internet of course. Euro-Trac: You're the first caller. You win a pepperoni pizza. Yeah...it's smart that you steer the VTB contests in this direction. Trivia contests aren't fair, because Lisa always wins. T-Scribby: Calcutta for toilet paper and Bangkok for toothpaste? Your house must've had an ENORMOUS bathroom. Presumably, your kitchen pantry was located somewhere across the Laos border. Lady Di: My vegemighty friend. Without the Internet, a lot more of us would be on Prozac. And to think...we owe it all to Al Gore. Being an Italian/Turkish/Greek expat living in Canada (Sal, thank you - very nice gesture :) I completely AGREE with this article. I've lived in a few too many countries and left too many loves ones behind. It feels like I live more on the internet than anywhere physical! You are a very eloquent man. Cheers! Great thoughts man! I'm a little curious about the buttermilk thing though. It's nothing exotic and really should be available. Last time I was there milk came delivered to the house in glass bottles with lids of the same sort as glass soda bottles. I also recall yogurt being available and also butter. Seems to me that if you have milk & butter, you should be able to aquire buttermilk. After all, buttermilk is the residue from making butter?!?!? As for the Vegemite, I do believe it is an extract of a variety of yeast. I've committed myself to trying it on sourdough toast at some point when I can both afford it and can locate it. I'll have to keep you posted on that one. Jo, the Vegemite, use it correctly the first time, and you'll love it ... if not, well I've found people quite rude if that first taste goes wrong. It needs butter as well, lots of it and a small amount of Vegemite applied ... it's about balance, don't slather it on that first time. I think it's probably the radio that works most for me - I try to listen to local radio for language improvement but the music is dispiriting, to put it mildly. Saturday night Swiss television is a little like being caught in a 1970's eurovision song contest time warp. A 1970's eurovision song contest time warp!? Wouldn't I win a chorizo pizza? I've mentioned here and there that I am a late bloomer and have only been on the internet since 1998. I met my very first virtual friends at a "Messies Anonymous" message board, of all places. My house didn't get any tidier, but a core group of these women are still my friends today - some of the closest friends and confidants I've ever had, even though I may never met them in person. And now I have this new bunch of expat friends to laugh and cry with, some of whom I actually have met. Life is good. I think the internet is a fantastic place to meet your 'soul family' - if you know what I mean - people who understand you and 'get' what you're about. Hmm...I wonder if Di could get some converts if she did a photo essay on the wonders of Vegemite when eaten properly? Christina, I snorted with laughter when I read your photo essay idea re the Vegemite. I think that vegemite is what we know in England as marmite. Marmite induces such strong reactions in people - it's a love it or hate it thing = that the manufacturers actually use this in their advertising, showing people fleeing in terror from marmite on toast. In my opinion, the only thing worse than actually eating it yourself is kissing someone who has eaten it. It's like nuclear waste in its ability to cling to things for seemingly years. Marmite is something else Heather, we have that too. It's stronger, Vegemite is its milder cousin. Nyana: Thanks for your comment. My own phone bill has gone on a sizable diet since I began using video chat. I even use it for some local calls. The service I use is at the following website: www.sightspeed.com What I like about Sightspeed is that it's free (the "Basic Plan" is, at least) and it flawlessly allows for Mac-to-PC video chats. None of the other services do. Lisa: Did you know that the Brady Bunch house had no toilets in the bathrooms, because TV censors wouldn't allow it? Of course you knew that. You're "Our Blessed Lady of TV Trivia." Granny Jo: Milk in glass bottles? In Spain?! I don't know when you were last here, but I suspect that Cervantes was still writing Chapter 1. All milk these days are in Tetrabrik cartons or plastic jugs. We have 10,000 different types of yogurt, but I've yet to see any sign of buttermilk. Or, for that matter, sour cream...much to my chagrin, and that of my Romanian cleaning lady. Lady Di/Christina: I must agree with Christina. I would really love to see a Vegemite 101 post on Wandering Woman. You'd be providing a great service to those of us to stupid to use Vegemite correctly. Yes folks...I'm the one who ate it with a spoon in 1988...and I can still taste it. Euro-Trac: Perhaps we should start calling you "EuroVision." Heather: Our TV situation here is Spain is similar. I thought we had a monopoly of cheesy TV here in Spain. They say that humor doesn't transfer well across cultures, and that's certainly been my experience when watching the sitcom's here (except for "Las Noticias d Guiñol" (are something to that effect), which is quite brilliant. But it could be worse. We could be living in Italy. You ain't lived until you've watched a variety show on Italian TV...and then you'll lose your will to live. Try Googling "Buttermilk Powder." I have used it before and it beats using plain milk. It also travels well and can probably be shipped internationally. You can find your own pancake recipe. ::chuckles softly:: The last time I was in Spain, "El Gato Serafin" was a big hit in the kid's music world. There was only one TV channel. Ca' Demoni was a big time restaurant in Mallorca (specializing in butifarones & sobrasada). King Juan Carlos had recently returned to the throne. And a Pyjama was a popular desert. Oh yea, and Ca'n Juan de Saigo was still in it's original location. About 30 years ago, I was 17 at the time. On another note, JRPfeff has the right idea. I think I might be able to help you out. You might even want to take it one step further and source "Bisquick". It makes the very best biscuits, and the buttermilk is in the mix. Just add milk! ah, Sal, you give me too much credit. I actually only answered ONE question pertaining to t.v. The other was a movie related question (Blackula)...and I believe, it was for 5 euros. Now, I don't recall you placing anything up for this little quiz...wanna go double or nothing? Regarding cultural differences, has there been any note of Don Knotts passing in Europe? The U.S. has been having a lovefest with him since he died. Most of my favorite blogs have written about him and the TV Land cable network has a Andy Griffith Show marathon running. Your little sister is finally ready to get her webcam up and running. So, I'll be looking for my detailed instructions via email! The sooner you do it, the sooner you get to see your beautiful nieces and vice versa! Junior Pfeff and Granny Jo: Thanks for those suggestions on the buttermilk surrogate. I actually have tried the milk and lemon juice trick. It certainly isn't as thick as real buttermilk, but it worked in a pinch. I used it for...buttermilk pancakes. As for Don Knotts, it's been a non-event here. That's not surprising, since Andy Griffith and Three's Company don't have much of a following in Spain (far as I can tell). But brace yourselves for the eventual death of Woody Allen. I assure you that the entire nation will fall to its knees. Lisa: Double or nothing? Hmmm...how confident are you on your Ruth Buzzi trivia? Nina: Your email instructions have been sent. SightSpeed awaits you. You'll soon be tossing your telephone into the garbage. If you do the lemon/milk trick, you should allow it to "sit quietly" for a minimum of 30 minutes. It also helps if the milk is room temp to begin with. Is that Ruth Buzzi of US commercial fame? Do you know, I took the time to photograph my lunch this morning ... taking special care to capture the detail of the butter to Vegemite ratio ... dammit, what have you guys done to me!!?? I am as yet undecided as to whether I am ready to shoulder the burden of Professor of Vegemite ... notes as to the accessibility of 'Vegemite 101 classes' will be posted here. Granny Jo: Mannix. Mike Connors. The guy with the big, black pompadour. I'm older than your think, but much younger than I feel. Kath: Yes, Ruth Buzzi...as in Jim Nabor's intergalactic co-pilot in the Sid & Marty Croft show called...[LISA?]. Lady Di: Not to put any undue pressure on you, but...if you don't post the vegemite primer, I'll die. actually, the Lost Saucer wasn't a show I ever watched but The Land of the Lost was a Saturday morning necessity. Ruth Buzzi, as I recall, was also on Laugh-In in prime time...the old woman on the bench who would hit the old guy with her purse for being a dirty ol' man. That's it! This is a battle that I can't win. From now on, my conversations with Lisa will be limited to applied mathmatics and molecular biology. I never watched Lost Saucer much either. Even at age 10, the show seemed really, really corny. But Land of the Lost was a staple of my childhood...depsite the fact that it was only equally corny. Then there was "Bigfoot and Wildboy." And "Sigmund and the Sea Monsters." And that truly awful show with the Bay City Rollers (name escapes me). And really stretching back in time...I have fond, fond memories of "The Banana Splits." And of course, "The Monkees." That was a crucial program in my early childhood development. Why don't they make shows like these anymore? All the 7-10 year olds I know don't watch Saturday morning TV at all. Instead, they watch Paris Hilton, Pamela Anderson and (now) Kid Rock on their video iPods. PS: Dirty old man? Artie Johnson! Oddly enough, I was talking about Sigmund the Sea Monster this morning, checking out whether it had been part of the Belgian childhood experience ... (I'd been told I was beautiful and on looking in the bathroom mirror, I noted more of a resemblance to Sigmund than Paris or any other creature of beauty). What was that show where the 70s teenagers flew around ... the Buggaloos? That wasn't the Bay City Rollers show was it? Sal, I do believe you might just be exaggerating about death and a Vegemite primer ... mocking me even. I'm just a toy for your psychological play ... sigh, I see it. It was the 'die' that gave it away. Lassie, Flipper, Daniel Boone, and Skippy were responsible for more than a few childhood tears ... specially Lassie, she almost died every episode. Ahem...that show with the Bay City Rollers was NOT awful. I adored it. I wanted to marry Eric (or was it Woody?) and have his children. Loved Laugh-In but could not watch a single Lassie episode without dissolving into a puddle. So true Sal. I wrote of my similar reliance on the internet for Expatica Belgium. I watched the Olympics, listen to CBC radio and talk to the folks back home with the internet. I can't imagine being here without it! We really are going back in time!!! If it's any consolation, Christina I had an enormous *crush* on Davy Jones of Monkees fame. Little did I realise that I would have also had that effect on him seeing as he was all of 4ft nothing and barely 100lbs soking wet! Alison: My God. I hadn't read your Expatica post until now, but the similarities are scary. We both start off with the communications angle (you Skype; me SightSpeed), and then eventually work our way into the Amazon connection. Once again, demented minds think alike. I only regret that yours was published six days before mine...which would give you the edge in a plagarism lawsuit. Perhaps we should be coordinating our Expatica posts to avoid future coincidences. Otherwise, Simon might start thinking that you and I are the same person. The Monkees! Yes! They were my first love. And Davy was definitely the one I wanted. Sal: I think the similarities just go to show how it doesn't really matter where you are an expat - we often have the same experiences, issues etc. I've had the same thing happen after reading some of Rene's (Expatica Germany)posts. Just look at the internet community of expat bloggers who reach out to one another from around the world... being a stranger in a strange land seems to have that effect. Jo said, "I think we watched a little to much TV back then... ;o)"
MY BITTERSWEET LOVE AFFAIR WITH CONGUITOS. HASHING THROUGH THE VALLEY OF DEATH.